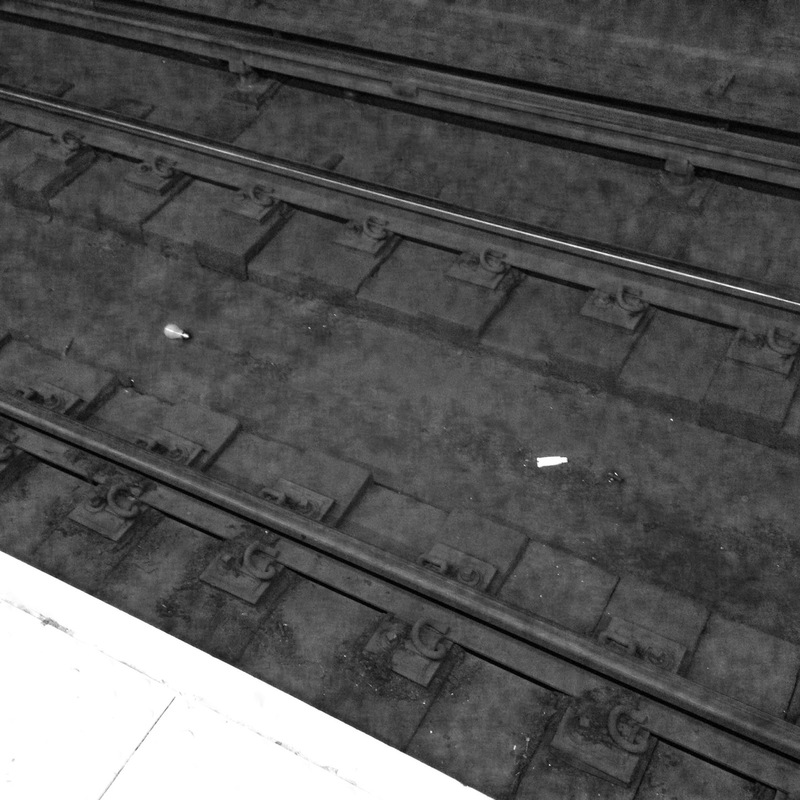 When I'm standing on the platform waiting for my train, I often scan the tracks looking at the debris people left behind. When the train takes a long time to arrive, my mind begins to wander about the debris. Sometimes I come up with absurd ideas. Absurd ideas that make for good blogging. 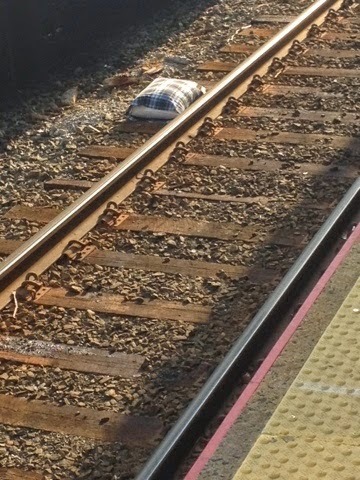 Pillow on the track. Yes, I know, this is a rerun. But there have been quite a few new followers since I posted this, so it's fresh to some. Besides, it's worth revisiting. I'm guessing some guy was standing on the platform waiting for the train, holding his pillow, when... WHOOPS! It went flying down to the tracks. Well, that's the realistic story. But what fun is a realistic story? Maybe he looked at the pillow and saw an evil image in a drool stain. Thinking it was possessed, he cried, "CAST YE OUT, OH EVIL ONE!" He then tossed the pillow to the tracks. This caused the man next to him to momentarily peer above the horoscope page, shrug, and return to guidance on avoiding love decisions until his moon left Pluto. And there the Beelzebub pillow sat. On the tracks. And we were saved. A light bulb and a tube of toothpaste. If you zoom in on the picture of the tracks, you'll see that those two specks of white on the track bed are a) a light bulb, and b) a tube of toothpaste. I know there's a story here. The light bulb is the curious item to me. How did the bulb get down to the track bed, unbroken? It's just sitting there, waiting for a Jewish groom to step on it, so everyone back on the platform can yell "MAZEL TOV!" Perhaps a groom-to-be was on his way to his wedding, and dropped the ring on the tracks. It's not safe to go down to the tracks of course, but he couldn't leave the ring behind. So, he went down there and got the ring. As he picked it up, the bulb rolled out of his bag, along with the toothpaste. I hope the absent-minded and clumsy groom made it to the wedding. I hope the wedding took place. Most of all, I hope he knows that a happy wife is a happy life. After writing this post, I'd like to thank my wife for putting up with me.